Brett - you are fortunate to have collected two Talana POWs and even more so MI as they are the rarest. Frank - would like to see your example, attached is the box lid which looks like "current issue", i.e post 1953. Mike - a very nice group, shame the OFS clasp has been defaced. A correction, Meurig. Only one of my KRRC MI medal groups is to a Talana POW. The other is a QSA/KSA pair to a man in the 2nd KRRC MI, which took party in the Relief of Ladysmith. This company was the only Imperial unit in the Composite Regiment of the Mounted Brigade. The medal came from a very kind collector of KRRC medals, who knew of my interest in the RoL. This QSA/KSA pair was one of only two that he had encountered in his long collecting career, so it is one of the most prized elements in my collection. The crown is pre 1953 and not the St Edwards crown, upon looking again, at your photographs, those boxes do appear to have considerable age to them. The Royal Mint will almost certainly be likely to have very particular records regarding the QSA/KSA but, the problem is they can no longer be accessed and I doubt if they have employed a librarian of their own for the last couple of decades to help, they used to have a very good one. I will add the RDF pair over the weekend and I see there is now, this specialist POW section. Okay Brett, I will do over the weekend, I don't collect or rate POW medals with any particular special regard, but, I was very interested to read Meurig's comments on MI prisoners. I would indeed like to see your RDF POW medal. Thank you for offering to open a new thread with it. The RDF was one of my early interests, and I still scan dealer's and auction lists in the hope of finding a Talana RDF POW. The trouble with these early Mounted Infantrymen is that they are not identified as such on their medals. The 1st and 2nd KRRC MI QSA's I do have were identified as such by previous owners, so I knew what I was buying. 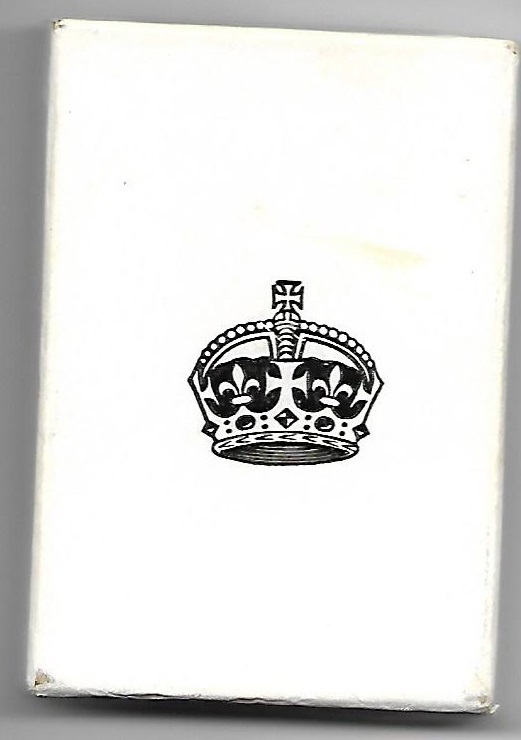 I kept my boxes, this is the St Edwards crown I made mention of, the card boxes were still issued well into this century, whilst "modern" they are not "current"
You would certainly not see this in Bertie's days pre 1953. Sadly, things seem to have degenerated yet further into this, which looks like something a certain Gerald Ratner might have sold! Still, never mind, at least Her Majesties crown has been retained. I have since found Bracken died in Toronto, Canada in 1957 where at least one daughter lived.